The Education and Learning department helps leaders work together to develop a skilled and innovative society that will prepare Canadians for today’s knowledge-based economy. We conduct leading-edge research, facilitate dialogue, recognize excellence and communicate results, creating maximum impact and change in Canada's educational practices and policies. 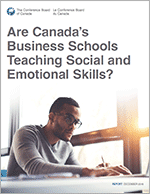 The Conference Board of Canada’s Centre for Skills and Post-Secondary Education (SPSE) is a multi-year initiative that examines the advanced skills and education challenges facing Canada today. While education is a provincial/territorial responsibility, improving Canada’s skills and post-secondary education performance is a national priority. The Centre examines important themes and issues in post-secondary education from a pan-Canadian perspective. The Centre involves a broad collaboration of public and private sector stakeholders. Together, we aim to address the future of work and the drivers of change in the educational landscape. Build inclusive, cross-sectoral national platforms for Canada’s post-secondary education systems. 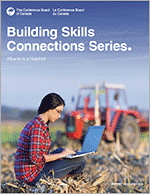 Track and report on challenges and best practices in Canadian post-secondary education. Build a strong empirical base and foster dialogue among skills and PSE stakeholders to generate common understanding, shared purpose and collaborative action. Raise public awareness of the nature and importance of skills and the PSE sector to Canada’s economy, society and culture. This will require a combination of research, convening, and communications to stimulate evidence-based public understanding, and engage the key players in Canada's PSE systems, including senior management, faculty and staff, government, business, professional and regulatory associations, communities and students. Are You a School Board?